At their November 16 meeting in Snata Barabara, the state Fish and Game Cimmission recognized the contributions SCBS has made to desert bighron conservation with a Resolution. The resolution was framed and presented and several commissioners added personal comments as well. They were all very appreciative of the efforts we have accomplished - many thanks to all of the members and volunteers for helping! The meeting was recessed for a couple minutes while a photo was taken. 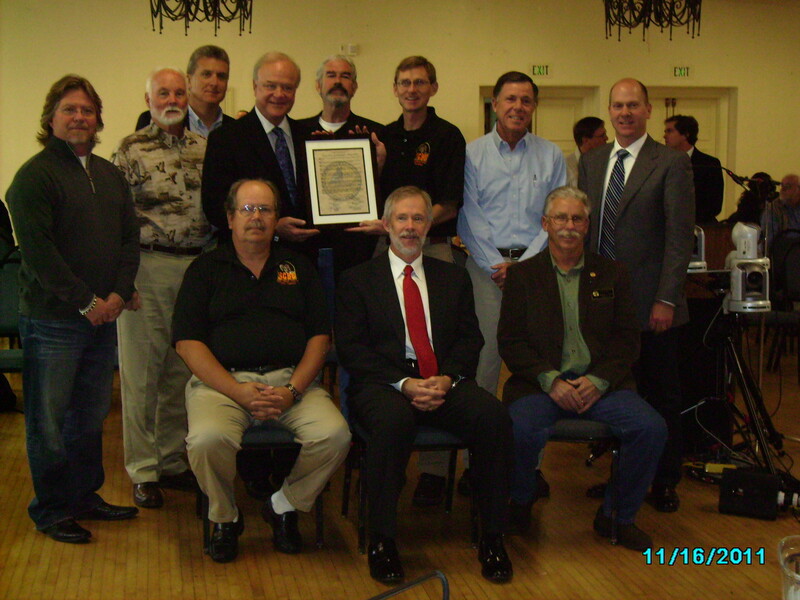 The entire meeting was video taped and is available through www.cal-span.org George Kerr, Bob Burke, John Hybarger, Norm Lopez and Steve Marschke accepted the award for SCBS. Commissioner Dan Richards (also a SCBS life member) was present as well. The framed Resolution is currently at my house but will be at the annual memeber's meeting before it's final home at Camp Cady. Contact Steve Marschke if you would like to have a scanned copy of the resolution. Re: Recent petition from CBD to ban access and hunting on the MNP in the name of the Desert Tortoise. To the Center for Biological Diversity, apparently this is all a game. The Center's upcoming series of petitions to end all human access to the 16 million acres of Desert Tortoise habitat here in California is just another sorry chapter in their quest to make the Forest and Fish & Wildlife Services look foolish at the expense of every other poor sorry uninformed and uninvolved average American.